Never did I think I’d be traveling in Cambodia… but here I am sitting in a hot internet cafe on a dusty street in Siem Reap. Sticky. That’s how I describe this place. It is not Rainy Season at the moment and so the weather remains hot and sticky. My body is constantly covered in a layer of slimy sweat. That’s easy. I wanted to see Angkor Wat. The border crossing was awful, the relentless calls for ‘tuk tuk’ are annoying, the scorching sun burns my white pasty skin, and the sad little children playing in the dirt just break your heart, but none of this mattered once I caught a glimpse of these amazing temples. 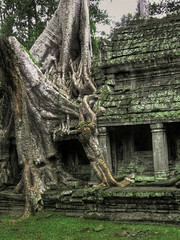 Angkor means ‘Holy City’ and Wat means ‘temple’… so Angkor Wat is the City of Temples. It is an ancient capital city that was populated between the 9th and 12th centuries AD. More than a million people lived in and around this city. Everyone can feel the abundance of power this place holds. Watching the Earth trying to reclaim its land is my favorite site to see around these ancient temples. Trees grow right through brick and stone, shoving dirt, moving walls, making way for their roots. I saw temples like this in Mexico too. 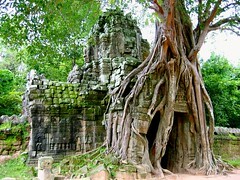 There are many temples in the Siem Reap area. We rented bicycles one day and did a 27km loop that took us to 6 different ancient temple sites. We also hired a tuk tuk driver one day to take us out to the Roluos Group of temples because they were too far away to bike in this heat. People can buy 1, 3 or 7 day passes to the Angkor area. It is a bit like getting a visa for a different country. They take your picture and it is only good for a certain amount of time. Once you have your pass, you are admitted into any of the temples as many times as you want. I recommend seeing the sunset while sitting in front of Angkor Wat. This temple is the only temple, in this area, that faces West. So if you’re sitting in front, you’ll be facing the beautiful orange, pink and purple sunset. Watching the sun go down over a jungle, with only a few temple buildings and palm trees in the skyline, gave me the most serene sense of being I have had in a long time.